But I can already tell you that during the development process I get amazing support from (in random order): Professor landscape architect at the TU Delft (Technical University) Dirk Sijmons (NL), Professor Energy Transition & Network Integration at the Hanze University of Applied Sciences Groningen Martien Visser (NL), designer and advisor in transition towards a sustainable society Ernst Vuyk (NL), Senior account manager NEMO (Science Museum Amsterdam) Fenna van Wijngaarden (NL), visual artist and professor at the Academy of Fine Arts in Brussels Stephan Balleux (BE), composer and musician Danny de Graan (NL) and Wouter Snoei (NL), cultural journalist Jaïr Tchong (NL), music producer Kees van de Wiel (NL), sound artists Strijbos & van Rijswijk (NL), technical advisor in wind energy Frans Van Hulle (BE), artist, musicologist and curator Jacqueline Heerema (NL). More will be followed….! 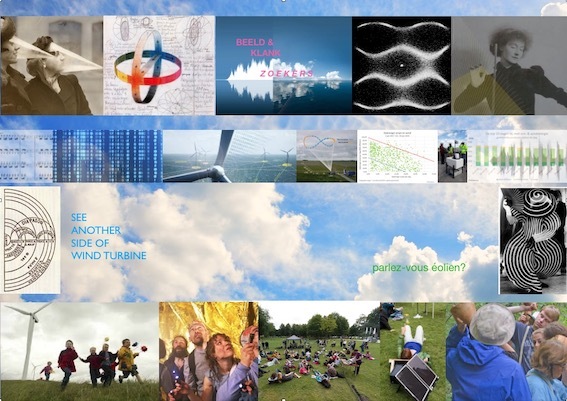 The Project Wind Turbine gathers a polyphony of insights and ideas from eminent international artists with diverse visions on music, sound and visual arts. They work and navigate through our landscape together with scientists, philosophers and companies from the sustainable energy sector and try to translate the major changes that are taking place. I am convinced that it is precisely this quantity and diversity of thinkers and creators that creates an extensive dialogue with the environment. Precisely because of their diverse work and approaches, the complexity of the subject becomes most visible to a wide audience. The wind turbine; everyone knows it, but only in their function. Some are for and others against, but how do I and you relate to this image and what can connect us with this object and our landscape? Can their sounds have a meaning, a sense of place and time? Those who become involved in the project will be encouraged in an active, imaginative way to listen again and look at the objects and processes that surround us in our daily lives. And while we play with the possibilities and meanings of sound and image, we discover our own unique stories to tell. The wind turbine stands for a powerful symbol, both of hope and a clean future and of alienation and uncertainty. How do we deal with space and the landscape? Every form of energy generation requires spatial interventions and every energy source has its own spatial footprint. Landscape is loaded with values, from individual memories to social symbols. A subject in which both the relationship between man and nature and the relationship between man resonate. What could connect us with this object and our landscape: Do they talk to the wind? Can there be any kind of communication between them? Could their sounds carry a meaning, a sense of place and time? This movie is part of a Sound and Space Research project at the Ionion Center for the Arts and Culture, Kefalonia Island, Greece. My research on the island started by my fascination how we humans are continuously sculpting the surface and changing our landscape since early history till today. The Island Kefalonia is carrying an impressive history; in every place you can find old graves from BC. In the middle of the island, on top of the hills, I discovered contemporary giant monumental instruments: the Wind turbine. A machine that harvests the wind and that points to a world of possibilities, such as durability, innovation and mechanical precision. With its constant universal movement and its slow drop shadow it is buzzing and transforming these hills into a place of fiction. My next step in my research was how to approach these places. Their sound is moving invisible through the air, they are connecting me with them. The old graves have a story, the Wind turbines not just yet, but only seen as a device that converts the wind’s kinetic energy into electrical energy.